One of the things that is in the list in my 50 before 40 is for my photos and articles to be published in a magazine, specially a travel magazine. I've been reading a lot of travel stuffs in travel magazines and books and I envy those writers who can just scribble and relate their experiences. Since then, I told myself that one day, I will also write travel stories since I travel a lot. I started blogging in October 2011, for the purpose of recording precious memories of my trips and helping other people too who want to travel independently. I didn't expect that that would open doors for me in the publishing industry. Because of blogging, my network became huge. I was able to connect to fellow backpackers, travelers, and bloggers. One of my friends (although we haven't met yet in person) is Lois Yasay of Sole Sisters. She was the one who inspired me to continue blogging. What caught my attention in their site is their 30 before 30. 30 things they need to do or accomplish before they reach the age of 30, together with Chi Chi Bacolod, her travel partner. When I saw that one of their dreams is for their articles to be published in a travel magazine, it reminded me of my dream too. 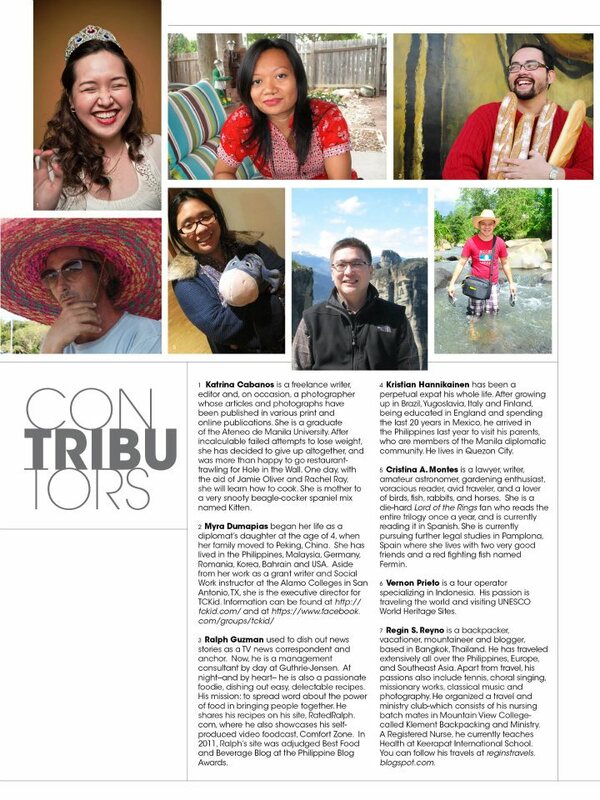 So when their article was finally published in a travel magazine last January (Smile magazine), it made me exert more effort for my articles to be published too. I passed articles and photos to different travel magazines. After weeks of doing that, nothing happened. I said to myself maybe it's not yet my time. I continued to pray. 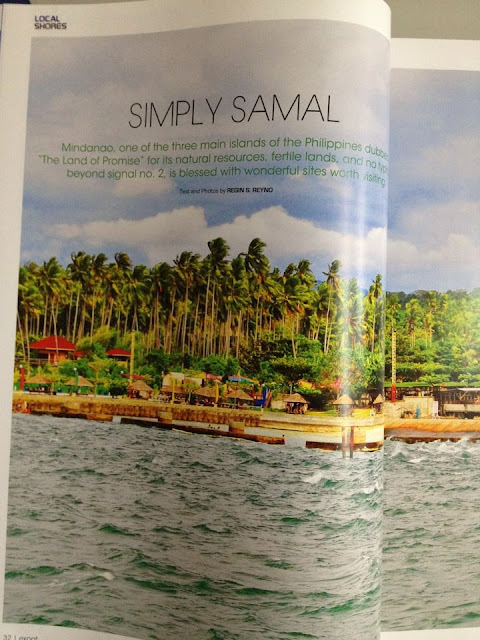 Then one day, last February, the Art Director of a travel magazine in the Philippines called Expat Travel and Lifestyle, Pen Pagaduan emailed me asking if I can write a travel story about Mindanao since she saw my photos in facebook. I said to myself, "this is it, thank you Lord". But the problem is, they need it immediately to the point that I have barely 1-2 days to do it. Anyways, I just did it. I wrote it on a Saturday night and submitted it the next day. (Half-cooked, hehe). So that's how it went. And today, March 7, 2012, the magazine was released, thus my first published article and photos ever. I thank God for giving me this opportunity, Pen Pagaduan for inviting me to write and submit my photos, my parents for good genes (my dad was the editor-in-chief of CVSH newsletter and a photographer too) and to Lois Yasay who encouraged us to just write, blog, blog and blog. To God be the Glory! P.S. : Pen Pagaduan knew that we'll be going to Phi Phi island (The Beach) in April and invited me again to write for their mag about that beautiful island. More articles and photos are coming! Grab a copy of Expat Travel and Lifestyle magazine now. Available in bookstores and magazine stands all over the Philippines. Congratulations, Mr. Regin Reyno. Expat Travel and Lifestyle magazine is looking forward to work with you more in the future. Keep traveling and always have that passion to share your experiences with others. Thank you. That's good news for me. Salamat ate Pen... I really wanna share more articles for your magazine. Thanks for the invitation. ganda talaga pare... na publish na ung article at photos mo! congratz do!! sana ma accept ka na sa Pinoy Travel Bloggers...para dalawa na tayo! Thank you pre. Oo nga, sana maaccept na.